Volleyball Spike | How to learn to swing? How to learn Volleyball Spike? This volleyball spike section of basic volleyball skills focuses on few the most important aspects of hitting. Discover few the most important factors in spiking. Definition - What is a Volleyball Spike? A player approaches the ball using basic four (or three) step approach to generate high forward speed. A player redirects that speed into the upward energy by jumping up to the air. Created speed, arm action of the jump and powerful jump are important factors in lifting the player up. On the top of the reach player performs an arm swing and uses her middle body power (“abs crunch“) to add power to her swing. A spiker swings the ball over the net to desired target by hitting the ball with the palm of her hand. 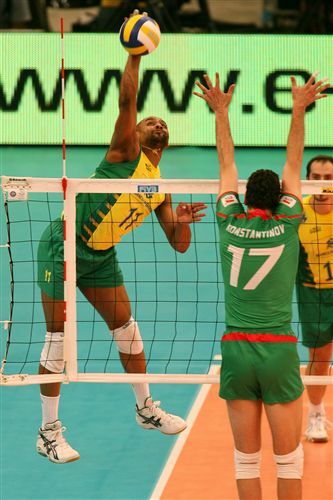 A spike is usually performed on the third contact after the setter, the playmaker of your team has set up the ball. The purpose of spike is to score a point for your team and finish the ongoing rally - or at least to make other team's playmaking as hard as possible. A spike could be also called a hit, a swing or a shot. A spike is a very complex skill and it takes a lot of patience and perseverance to master in it. The spike requires quickness, agility, explosive power, strength, hand-eye coordination and whole- body coordination. The purpose of the first two steps is to create you forward speed. The speed is very important factor pulling you higher up when you jump. Work on developing your steps into a very smooth approach. The second step, in other words the step before the plant, is CRUCIAL to develop the speed. You should really "push it" to generate the maximum speed. 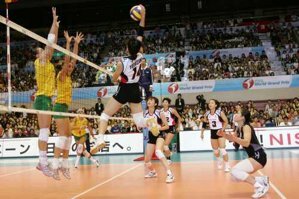 Timing is usually very challenging for starting volleyball players. Especially in the beginning, it is difficult to know what is the right moment to start the approach. It might be frustrating because sometimes you leave too early, sometimes too late. 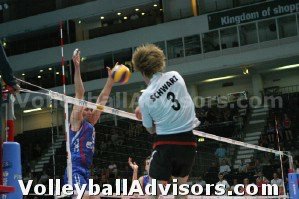 A good general rule to get a correct timing is to place your right foot on the ground when the setter touches the ball. After that you just take you step 2 with your left foot, and set up the plant (steps 3 and 4 next to each other) and take off to the air. In the air focus on reaching high and making a good contact to the ball. The control beats the power when learning volleyball spike. Repeating one controlled swing after another makes your spike more and more natural. More natural and relaxed the spike is, the more speed and power you have on it. To get a top spin, you have to place your hand on the top of the ball. If you place it to the middle of the ball, it will float. If you place it on the bottom, it creates a down-spin. Place it on the top, you will create a top-spin. Volleyball Offense - How to Learn Transition?